These photographs were taken on board the Asturias in November 1948, by Pat Piggott. His wife Irene (Rene) and son Michael are pictured with other passengers. If you can identify them, please let us know. The boat train from Kings Cross station took us to Southampton docks, alongside our home for the next three weeks, the HMT Asturias. She was a troopship of 22,000 tons but from the dockside looked every bit as big as what I imagined the Queen Mary to be, a huge black bulk of steel that seemed to rise up forever. Compared to the tramp colliers I was familiar with in Amble harbour, this was a totally awesome sight. Long queues of fellow migrants were strung out along the length of the ship, being processed and boarding at various gangways. It was a tedious exercise but eventually the moment came when we walked up the gangway and into the ship to find our accommodation. Being a troopship, the cabins were large enough to accommodate 8 to 10 people and were segregated, which meant that families were separated for the duration of the voyage. I was in a cabin with my father and brother and about 6 other men. My mother was in a female cabin a short distance along the corridor. There were communal bathroom and toilet facilities scattered about the deck and it often meant standing in line to use them. The bathrooms did not include showers in those days, only bathtubs and I was always intrigued by the fact that nearly every morning a mattress could be found in the bath. In my juvenile innocence I imagined that some unfortunate person had missed out on a bunk and had to sleep in the bathtub! Despite the less than luxurious accommodation, the dining room offered very acceptable standards of quality and variety which impressed me greatly. There did not seem to be any rationing here! This was apparently funded by the Australian government, to Australian standards so I was having no regrets about the prospective new lifestyle ahead of me. 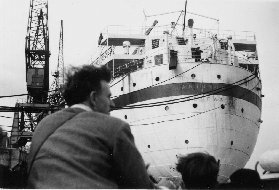 The voyage to Fremantle was 3 ½ weeks of fascination. Although there was no formal schooling during the sea trip, daily activities were organised for the many kids on board. The ship called at Malta to pick up further passengers and this added another dimension to my ever-widening experience of life. Valetta harbour was a very different harbour to ones I had previously known in England. On both sides, tiers of whitewashed houses seemed to rise from the water’s edge and reach up to the sky. It was high density living with a difference. A feature of Maltese lifestyle I found quite staggering was the number of boys of my own age who came on board smoking cigarettes, which they continued to do for the rest of the voyage. An amazing number of gondola-like boats crowded around the ship, offering all manner of items for sale to passengers. This was a system of trade that was encountered again at our next stop, Port Said. Here the floating vendors would throw a light rope from their boat up to the ship’s passengers and the end tied to the ship’s rail. A basket on the other end was then used to haul up selected purchases and the agreed price sent down by the same means. My father negotiated to buy what appeared to be an ornamental Arabian dagger for me and having sent down the few coins in payment, I discovered that it was made of a very weak aluminium allow. A lesson was learned at that point. The ship remained at Port Said for only a couple of hours as we were taking our place in a queue of vessels transiting the Suez Canal. It was slow progress through the canal because of the narrowness in parts and the number of ships passing through. There was a special meaning attached to this phase of our journey as I had learned about the Suez at school and here I was, actually sailing through it. The ship paused again on reaching the Great Bitter Lake to allow Northbound shipping to pass before entering the Southern section of the canal en route to the Red Sea. At Aden the ship re-fuelled and we were able to go ashore for several hours to soak up the local atmosphere. It was a very hot and dusty place and our pale skins got some real exposure to the sun there. I can recall having photographs taken with a local policeman in Aden. The natives were friendly there in those days as Aden was a British Protectorate. The next port of call was Colombo in what was then Ceylon. It was a brief stop, only a few hours as I recall and not long enough to venture far beyond the immediate area of the harbour. My memory of what we did there is rather vague. The last stage of the voyage to Fremantle was full of eager anticipation of arrival at our new home. I tried to form mental pictures of what Australia would look like, based on what I had been told. Kangaroos and other native animals were a prominent feature of my imaginings, picturing them in everyone’s back yard. I thought a lot about what school would be like and conjured up visions of schools in the bush, which made very favourable comparisons with the glum old grey stone buildings I had left behind. Such things occupied my thoughts during the last few days of that wonderful journey.